Thanksgiving was spent in AZ this year, and man was I spoiled with nine days there. On the airplane down I got to sit next to a guy that I'm almost positive was drunk, so in went the headphones from the beginning. IPhone shuffle - The Format! How perfect...nothing says AZ to me like The Format does, GREAT beginning to my trip. Although most of my time there was spent solely with my parents (which was PERFECT) I did get to see family and friends. Mom and I spent a lot of our time over at Dorine's with her family, playing cards, talking, eating, etc. The first night at about 9, Mom decides we need ice cream. I am so down. She and I jump in the car, housecoats/pjs, and head to Dorine's to grab her. After our ice cream fix we of course HAD to watch a scary movie together. We started out claiming separate ends of Dorine's couches and by the first 20 minutes of the movie I jumped in the middle of them, there was no extra space between us. What can I say, we love our scary movies...I admit I am the biggest baby between us three during movies, but once we all get scared you can't tell the difference between our squeals. The only thing missing was our other sister Deena. Part of the best time there was seeing my nieces and nephews, it's always the best being able to spend time with them and catch up. I had to run errands one day and decided to take my cute Lily baby with me. Lily is probably the most happy child I have EVER come in contact with. She's about 5 and is amazingly happy and sweet. Whenever she sees me she calls out, "My Favorite Auntie Ashley!!!" Melts my heart everytime and makes me want to give her whatever she wants. 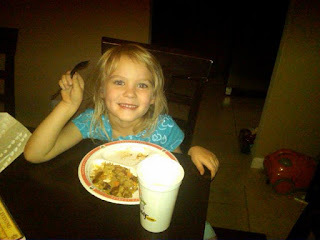 Anyway, she ran errands with me, by dinner time I decided we both deserved Cafe Rio tacos. Once we finally got them it literally took her 15 minutes to eat one taco! Funny story, in the middle of her dinner she tells me she needs to go to the bathroom, so I let her go by herself. She's in there for about 5 minutes before I get up and see if she's ok. The bathroom is packed with people as I'm trying to find her. She finally yells out that she's ok, but then she says, "There are no magazines in here! Where are they all?! I can't go without a magazine!" Yes, she really said that. Everyone just looks at me...luckily most had a good sense of humor and just laughed and winked at me like I was doing a great mothering job...nice.